Simple rules have several advantages of course. They can be easier to draft, carry less risk of getting parameters wrong and have greater ability to withstand market adaptions, compared to their more complex counterparts. And complex rules sometimes encourage the regulated to manage to the rule rather than managing their risk. Moreover there is convincing evidence that prior to the crisis, some complex bank regulation – in particular, some aspects of the Basel II accord – had been implemented in ways that had loop-holes. When it became clear that these were being exploited investors lost confidence in the veracity of some banks’ risk weight calculations. But just because some complex rules were flawed, it does not follow that all are. To illustrate, we take a simple example of a problem faced by regulators a few years ago. In 2012, the Basel Committee sought to agree the appropriate capital treatment for exposures to cleared derivatives portfolios (and the CCPs clearing them). An example – in the case of a hypothetical portfolio – is given in Chart 1. Some of these positions are designed to profit from increases in interest rates of a given maturity, some from decreases (ie. they have either positive or negative exposures to a given directional move in rates). Notice that, in common with many such cleared portfolios, these exposures are ‘well hedged’ – that is, they consist of a large number of exposures to interest rates, of different – yet similar – maturities, with opposite signs. Providing interest rates of all maturities change to a similar degree, the overall change in the value of the portfolios will be far less than the sum of the absolute value of individual exposures. 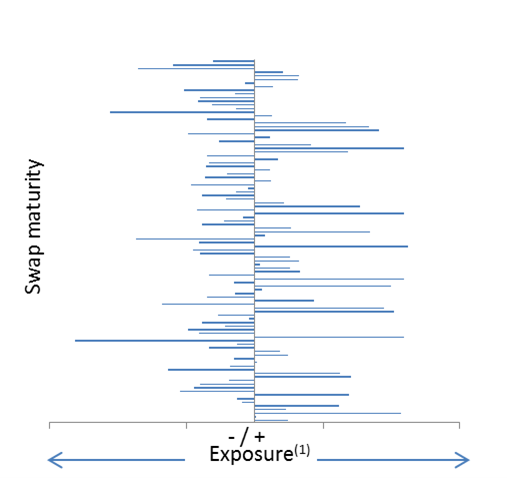 (1) Sensitivity of portfolio to a change in interest rates of a given maturity. Basel’s regulators chose at the time to try applying a simple heuristic in calculating banks’ capital charges against such portfolios. They used a simple rule which had been designed for small directional portfolios, and applied it to the much larger, better hedged cleared exposures. The chosen approach was the Current Exposure Method, or ‘CEM’, a regulatory rule that calculated capital requirements using a simple fixed percentage of their total notional value. This raised a problem. Whilst the risk of each individual derivative – that is, their sensitivity to changes in interest rates – was potentially large; put together, the risk of the hedged portfolio was, in aggregate, fairly small. But, in applying its simple methodology, the CEM cried wolf – and mistook the comparatively safe for the highly risky. Suddenly many portfolios that had never suffered material losses were subject to an enormous capital charge – so large in fact that it raised concerns that banks might be disincentivised from transacting such portfolios via a central counterparty all together. But perhaps this was just a price worth paying for simplicity? This might have been the case were simple rules always more prudent; but this is not the case. To see why, consider what a better representation of the risk of such a large and ‘well hedged’ derivatives portfolio might look like. 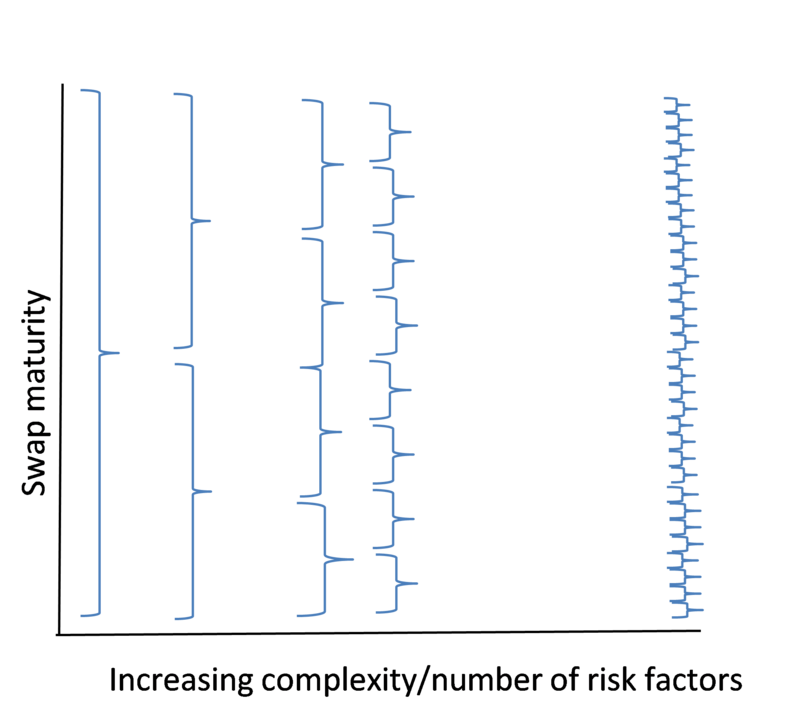 A key choice that a regulator need make is to what degree derivatives that profit from increases in one interest rate (say the two year rate) should be allowed to ‘cancel out’ or offset – risk from those that profit from a decrease in an interest rate of a similar – but not identical – tenor (say the three year). At one extreme, the exposure of all derivatives could be totalled up in its entirety. Positive and negative exposures would be allowed to cancel out. This would result in a simple representation of risk by a single parameter or ‘risk factor’, as it is known, represented by the far-left bracket on Chart 2. This is a world of utmost simplicity. It also results in a lower risk measure: by allowing exposures of differing signs to cancel out fully, whatever their maturity, the regulator in effect assumes that any increase in interest rates will occur at all maturities simultaneously. In such a scenario, because positive exposures to rising rates would gain – and negative exposures lose – money to an equal degree, the overall change in the value of our hypothetical portfolio would be relatively small. At the other extreme, the risk of every derivative could be considered separately, with the risk of the portfolio set equal to the sum of their absolute exposure, whether positive or negative. This, in effect, would be akin to a regulator ignoring the degree to which these, in reality, are likely to cancel out. This treatment is more complex, involving a far larger number of risk factors, as indicated by the bracket to the far right of Chart 2. All else being equal, this would result in a larger estimate of risk, though the calculation is also #more complex. It captures the possibility of how, at least in theory, two interest rates of very similar – but not identical – maturities could move by different amounts or even in opposite directions, meaning that the loss/gain seen on interest rates of one maturity would not be cancelled out by that on another. Between these two extremes lies a continuum of possibilities of bucketing and offsetting. These can be organised using a taxonomy of different representations of risk. Different approaches can differ markedly in their measures of risk for the same portfolio, and, potentially, capital requirements. All else being equal a finer representation of risk, reliant on more risk factors, and a more realistic treatment of offsets leads to a more risk appropriate capital charge, but entails a more complex calculation. This is of course just one example. But in principle what it reveals applies to the way risk is calculated on any portfolio. Rather like the flight path of the boomerang, the risk of the portfolio can be quite complex, and rather unintuitive. A more complex representation of risk can actually lead to a more prudent outcome. This discussion highlights the key role of the parameters in regulatory rules. Regulators do not just have to make decisions about how to measure individual risks, they also need to decide how much to let different risks offset each other, and how much capital to prescribe banks to hold against the net amount. The complexity of a rule isn’t just the length of its text: it also relates to the number of parameters it contains. A good example here is the rules which are replacing the CEM. These use three buckets to represent interest rate risk in each currency: exposures to rates less than one year; from one to five years; and over five years. Some benefit is given for offsets between buckets, and the overall framework was calibrated using data including a period of stress. These rules are appropriately complex, capturing essential features of the problem at hand, but not having so many parameters that it is impossible to calibrate. The question of what the ‘right’ measure of risk is, in situations such as this is a difficult one, requiring judgement. But it’s a judgement that requires a relatively complex view of the world, and one that accounts for the complexity of real portfolios with offsetting exposures. Joseph Noss works in the Bank’s Capital Markets Division and David Murphy works in the Bank’s Financial Market Infrastructure Division. 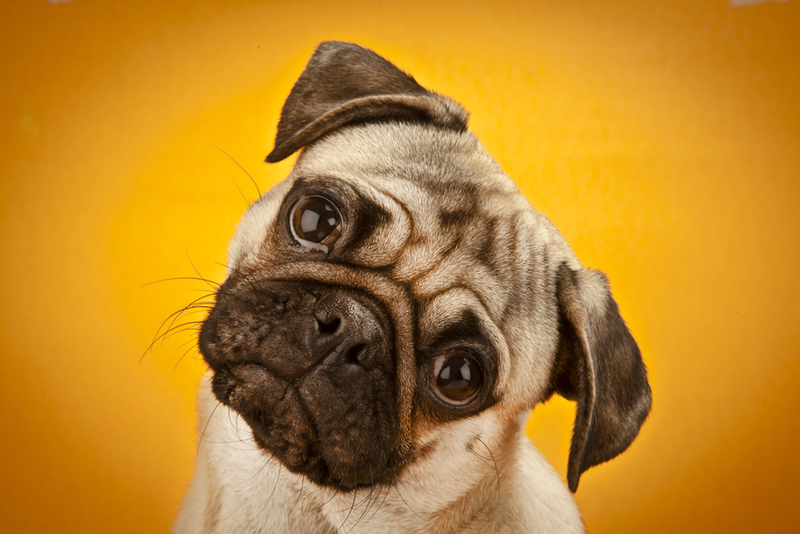 Woof, or at least half a woof plus a bit of barking. One thought is that risks are today understood to be not simply about particular instruments but also – and possibly more – about interactions between systems. Hence the term macroprudential. Now it can be argued that looking at an ensemble necessitates highly complex thinking (much more so than in the illustration mentioned: however it is doubtful whether such thinking could be done to sufficiently high levels of accuracy and certainty (especially in real time). A second though is that more complex rules may not constitute a barrier to regulatory arbitrage. And a third thought is that rules that ‘are appropriately complex, capturing essential features of the problem at hand, but not having so many parameters that it is impossible to calibrate’ are certainly less transparent in terms of political oversight. So, who gains from complexity? Prudential rules should be both complex and concise. There is no dichotomy between the two factors – both are essential elements of sound prudential policy. Key elements of a rigorous prudential policy include. 1. Précis skills: never use one thousand words when one hundred words will convey the prudential requirement. It is essential that prudential rules are both detailed and concise –using technical appendixes where a financial market or instrument is especially complex. 2. Technical skills: the appropriate regulator must be fully conversant with the logistics and mathematical basis of any financial market – an especially important factor in respect of financial derivatives. The Bank of England must, if required, recruit sufficient staff with the appropriate professional expertise in derivatives markets. 3. Legal expertise: prudential policy should require legal counsel opinion on any regulatory document, in order to ensure that the wording is watertight, thus preventing any legal challenge to regulatory action. 4. Financial market knowledge: individual regulators should be familiar with the day-to-day operation of any financial market in which the specific regulator has prudential responsibility. This could encompass selected BOE staff spending a brief period with a best practice treasury department of a well respected financial organisation. 5. Relationship with professional bodies: to the best of my knowledge, the Bank of England already has good working relationships with leading professional bodies such as the Association of Corporate Treasurers. 6. International financial market expertise: the UK is home to numerous organisations with cross border activity. The Bank of England probably needs to increase the number of professionals with international experience, as the UK moves from EU membership to a new regime (possibly associate EU membership) that will necessitate many UK financial organisations seeking new business opportunities in the wider global economy. 7. International regulation: regardless of UK (and other) political events, business finance is becoming increasingly global in nature, in the age of the internet and high technology mobile phones, I do not underestimate the complex task facing Bank of England regulators in respect of global technical advances. My personal view is that regulation should become more global in nature, building on the achievements of Basel Accords. For a number of important reasons, the Bank of England is well placed to take a lead role in global prudential regulation. 8. Based on many years experience of treasury management in two substantial and forward looking organisations, I believe that the majority of participants in UK financial markets look to the Bank of England to provide clear guidance on the rules of financial management. It is important that the same rules are applied to all organisations operating in the UK, and that robust financial (or other) sanctions are applied to those organisations who ignore BOE prudential rules. While it’s certainly true that simple regulations cannot accomplish some tasks, there is another alternative to complex regulations–not to regulate this particular thing. In general, when regulations become complex, I prefer the solution of finding a different regulatory approach that does not require the complexity. In the specific example of well-hedged derivative portfolios, there is no single number that captures all the risks; no precise amount of capital that makes holding the portfolio prudent. It’s not just that different interest rate models will give different numbers, but that the risk will change suddenly with market conditions, and that the gross size of the exposures will matter in some scenarios more than the aggregate market value changes. The answer is not a more complex model, but abandoning the idea of tying the capital requirement directly to the estimation of a number that doesn’t exist. Simpler approaches probably mean that instead of requiring banks to increase equity in order to hold well-hedged derivative portfolios, banks would not be allowed to hold well-hedged derivative portfolios in legal forms that could imperil bank equity in the first place. That may be undesirable for other reasons, but the risks are incalculable, so a policy decision to allow them should be taken seriously, not papered over with complex regulations. There are cases in which a complex design can work. A mechanical Swiss watch, for example. But those watches were designed over centuries of trial and error by meticulous craftsmen, and purchased voluntarily by users. With all due respect to even the best regulators, it’s not a good idea for people who have never built watches to try to draw one as complex as a Swiss watch on paper and insist everyone carry one before the first one is built. When you’re designing things this way–watches or regulations–it pays to keep it simple. A very quick comment on this thought provoking follow up: Complex rules can some times do a better job at catching risks as you note, however, I am not sure that the accuracy in capturing risk should be the ultimate benchmark for assessing whether a rule is flawed or not. Practical considerations should be taken into account when deciding the level of detail of rules and hence their degree of accuracy (and complexity) during the drafting stage. As I understand, you do accept that the ability to calibrate in real time is a practical consideration that should bear on how far one can go with complexity, however, there are other practical difficulties too. For example, there is no point having in place a set of obsolete but nonetheless appropriately complex rules with parameters that is possible to calibrate.